Working full time makes it difficult to squeeze in riding miles. The weekend was in mid-September and it was looking like July weather. I loaded my pack with light provisions and started the motorcycle. Klamath Falls was a 3 hour ride through southern Oregon mountains and the warm afternoon winds of the high elevation pine forest felt pleasant as I accelerated East. 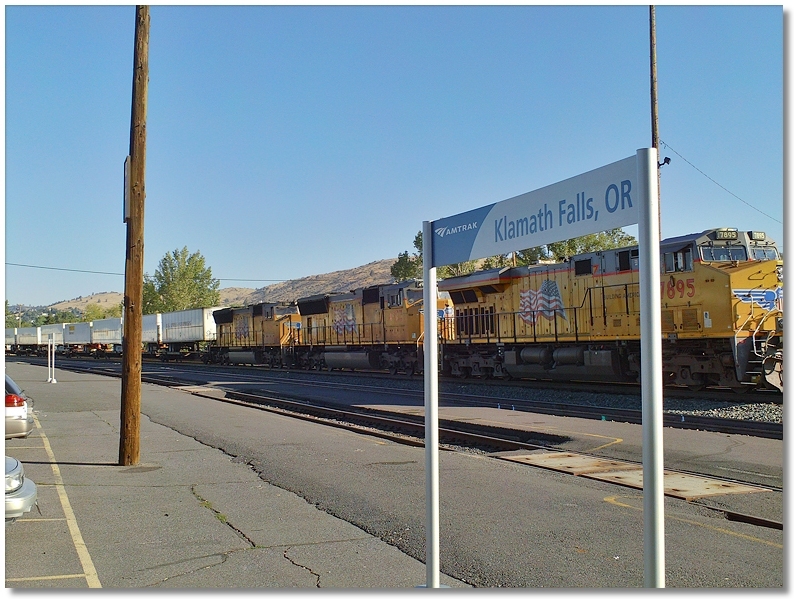 When your choices of closest crew change towns to begin a journey are either Dunsmuir or K-falls, it is hard to choose. Though I love many things about waiting along the Sacramento River for a northbound in Dunsmuir, there are no Burlington Northern Santa Fe trains. I wanted to get a few pictures of the Orange engines so this trip would start further north. 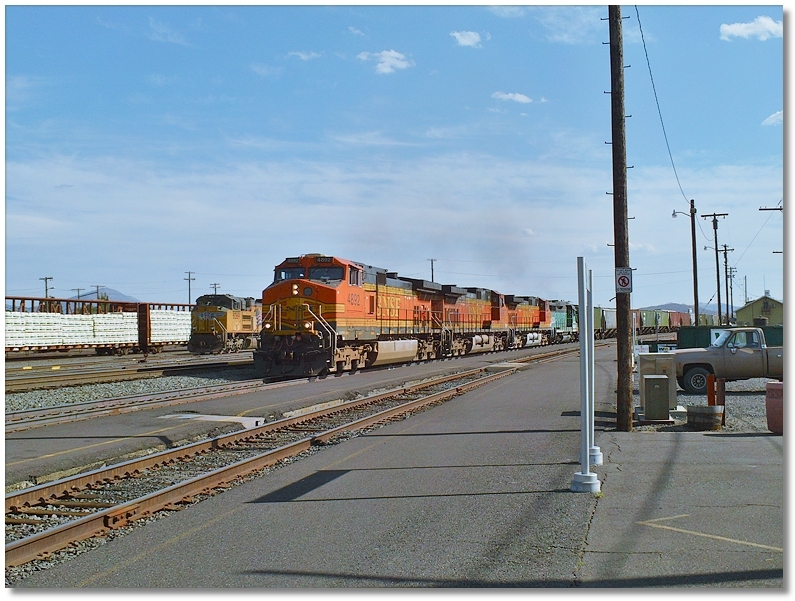 After enjoying the afternoon sun and getting my fill of BN yard activity it was time to start thinking about the nightly Union Pacific stack train heading for the Brooklyn yard in Portland. The ZLCBR would get to PDX in about 8 hours leaving me plenty of time to return, but it was the Cascade Summit siding along the way that interested me as a turn around. This plan was a gamble as trains do not need to stop but I was ready to take the odds. It was about 2300 when the units pulled into the station and I had about 3 minutes to choose a ride. The flat cars with trailers would have been fine but I opted for the luxury of a deep mini-well on a yellow ribbed 53. These cars are some of my favorite and maybe the most comfortable way to travel ever. We left Klamath Falls and did not stop for 3 hours. It was a spectacular night around the lake as the stars illuminated the sky. With steel wheels humming along the smooth track the engines pulled us steadily through the town of Chiloquin and the dark forests further north. The feeling of being on this train got my blood moving in anticipation of longer trips to places like Quebec and the woodlands of the Northeast. As the split in Chemult came into view our course was set and the Cascades began to lift us skybound. With the pass nearing and the train's speed holding I began to wonder if stopping was in the itinerary. There was a good chance dispatch had timed the other freights to wait elsewhere and I knew this fast train would not require an early crew change. Upon summiting and beginning the decent West, the first indications of slowing got me packing my goods and getting syked up for the mission. There are few things more exhilarating than switching trains on the fly in darkness on top of a mountain. It would be a challenge and that is part of why I was there. As we continued to slow, a stopped train sat next to us. I started to think it was all happening too fast; a few hours in the woods alone with nothing but starlight and quiet might be good for my soul. The ZLCBR finally cruised to a safe dismounting speed but the stopped freight was already moving. Indifference got the better of me and I let the southbound roll away. Within seconds the horn of another southbound could be heard approaching and this time I agreed it may be the last one for a while. I was ready and hoping it would be going slow but it was chugging along with conviction and threatening to pass me by. I watched and waited with the decision made that if it slowed I was on it. Just as the southbound signaled a decrease in speed, the northbound I was still on, started to pull. Generally Z trains can get moving at a speed too fast to catch within seconds and this one had the added aspect of facing downhill. Within a moment I was set on getting off the Z train even if it meant getting stuck in the mountains. The narrow channel between the two trains was shadow black and I relied greatly on my past experience to navigate safely. The southbound was now moving slow enough to board and the Z train was fiercely charging by within feet of my pack. The mission to transfer trains at Cascade Summit was successful and complete. It was time to get comfortable while falling into a sleep-like trance from the music of the railroad. I awoke a few hours later to the early morning sun and a few cars whizzing by my grainer porch. K-falls was 2 miles ahead and the train slowed enough to hop off. Not minding a morning stroll or wanting to risk there being a cop parked at the crossings ahead, it was an easy decision to take the leap. With a warm cup of Safeway's coffee I got a few more pictures before starting up the 250 and saying Hasta Luego to the trains.